Joseph Lamelas, M.D., performs close to 700 cardiac surgery cases each year – or more than 16,000 in a 26-year career. Most impressive, however, more than 7,000 of his operations have employed “minimally invasive” techniques and devices Dr. Lamelas himself pioneered, patented, or perfected. 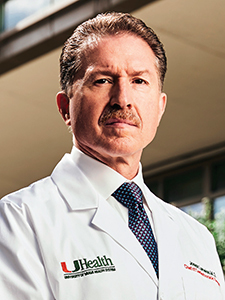 Now, he is bringing his remarkable numbers and outcomes to the Cardiovascular Division of the University of Miami Health System as Chief of Cardiothoracic Surgery and a professor of surgery at the Miller School of Medicine. Dr. Lamelas’ arrival at the University of Miami advances the level of world-class care and innovative procedures offered to patients from Florida, the nation, and the world. His arrival at UHealth will ensure Dr. Lamelas and his team perform revolutionary work in a collaborative, multidisciplinary approach to help ensure the best results for even the most complex cases. Cardiac surgery historically has required a sternotomy – an incision through the breastbone that leaves a tell-tale scar down the center of the chest. With a minimally invasive approach, Dr. Lamelas makes an incision between two ribs on the patient’s right side no longer than an index finger. Through that, he is able to access the heart, perform the procedure, and close up the incision, leaving a scar that is almost indiscernible. Advantages of this approach include reduced pain and trauma, less blood loss and risk of infection, shorter hospital stays, and quicker recuperation. Patients often are walking the same day. As well, research shows that high-risk patients – including the elderly, obese, or those with COPD or kidney issues – have better results with minimally invasive cardiac surgery. To learn more about Dr. Joseph Lamelas and innovative procedures available at the Cardiovascular Division at the University of Miami Health System, visit UMiamiCardiac.com.